The turning point in my entrepreneurial journey was when I discovered the power of rituals. It wasn’t just for my business, but something that empowered me personally as well. What was most shocking was how simple yet overlooked it all is. Part of having rituals in your day is taking breaks. It’s “not working”, so it becomes almost taboo for entrepreneurs. We all hear about the entrepreneurial lifestyle of working 16 hour days and sleeping overnight in the office. But that isn’t necessary. In fact, I’d argue that does more harm than good. In this article, I want to show you how small adjustments to your day can make major impacts on your efficiency, business, and mindset. So, routines, right? Or, no? What’s going on here? As a final note on what rituals are, they should be structured but flexible. Great rituals should undergo a never-ending change. They’re in constantly in flux, adjusting to changes in needs and desires, and based on experimenting with new elements. The key is that I always have a base ritual that helps me align to success. For the most part, it’s always the same, giving me that structure. However, I always give myself the flexibility to adjust it, because that flexibility enables creativity, and creative moments are most transformative. The rituals I suggest you start with are morning, night and one special occasion ritual. As an example of what I consider a special occasion, I consult with businesses on a regular basis. I want to ensure that I’m as attentive, clear, and capable as possible when we meet. I need to make sure I’m present with them and truly listening, not just hearing words they say. This requires a ritual that puts me in a present, awake, sharp state. We’re going to get deep here for a second. Ever think about your life in a mind-body-emotion-spirit way? Ever experience the connection? Chances are if you’re reading this, you’ve at least heard of this before. I’ll be the first to tell you, it’s not easy to make sure you follow this every day. We’re going to use this to think about our rituals with this framework. It’s the best I’ve found for myself. I’m sure there are dozens of others, but that’s why experimentation is so vital… to everything you do. MIND – Intellectual stimulation drives growth. It’s a fact that the more we do intellectually, the more our capabilities expand and the happier we are. BODY – Simply…move. Be active. I don’t care if you hit the gym and bench press 500 lbs. or go do 20 push-ups. Just do something. EMOTION – If we’re emotionally out of balance, we aren’t going to be very effective at anything we do. We’re emotionally driven creatures. When we’re in a good place emotionally, we’re empowered. When we’re not, well, it’s not so easy to be productive or happy. SPIRIT – I don’t care what you believe in. Spirit isn’t about believing in God, or the Universe, or anything. If you authentically can’t trust in any energy or ethos, that’s fine. You want to make sure you look internally, rather than externally, anyhow. Spiritually, you need something to drive you. What connects with your soul, giving you a fulfilled feeling? What passion hits you at the heart, whether you’re actively in it or not? We can certainly go overkill with any of these areas and burn ourselves out, but it should be simple enough to figure out the best flow of stimulation for you over time. Remember, these are rituals, not one-off tasks. That means they can and will improve. We established that rituals are empowering processes in our everyday lives. We have this framework we can use as well, mind-body-emotion-spirit. Now, let’s start with our first ritual. Everyone has some type of morning routine. They run the gamut. There’s the daily morning scrambles for clothes, shoes, coffee, and through the commute… and then there’s 5am workouts, hour-long meditations, impeccable breakfasts, and so on. Instead, just push yourself to make a 1% improvement day-to-day. 1% over the course of the year is a tremendous boost to your life. And, you can’t say no to a measly little 1%. Make sense? I like to keep things simple. So again, start small, shoot for 1% gains, and constantly experiment to improve. Now, what do we do in our ritual? Good question. Let’s finally get to that framework and put it to use. I believe each ritual should touch on each area at least once. Remember though, doing everything you can in each area isn’t necessarily better. Over time, you’ll be able to identify the high impact, low resource activities. More isn’t necessarily better, and I’d hope you have something else to do in your life than your ritual. So, if reading helps you kickstart your day more than journaling, then fine. Maybe you should put the journal away until at night and try it then? Mind: What do you find intellectually stimulating? Body: What brings your physically to life? Emotion: What keeps you stable, positive, and strong? Spirit: What drives you, fulfills you, and connects you to your core? Some activities have crossover. Meditation specifically is experienced vastly differently by many, so I placed that in three areas. The same can be said for others. For example, I find trail running great for my mind and spirit, although on the surface it seems to be all about the body. What other activities can I put in my ritual? I can’t answer that for you. I’ll tell you, part of my ritual is just getting my day started. To me, that means putting on my clothes for the day, getting rid of my bed head, and tossing in some contacts. It has a place in my day, especially when there are times when I don’t need to get dressed up for any reason…but the feeling on my skin of wearing nice clothes makes it worth being in my ritual. A Side Note: It’s worth mentioning, the coffee part is a ritual itself. I grind the beans every morning (formerly by hand but now in a grinder), boil water on the stove, make it with my AeroPress (upside-down method), and finally add the coconut oil, butter, and some cinnamon. And take that first sip… There’s something special about the process compared to pushing a button on a Keurig. Now, what do I attribute coffee to? Well, it helps my mind function and warms me up, so mind and body. But there’s also a warm feeling I get just thinking about a perfect cup of coffee. It puts me in a great state emotionally, and “brings me present”, so spiritual also? It hits them all. Don’t obsess over this stuff, just use the framework as a guide. At the moment, I feel like there’s just too much going on in my morning. At the same time, I’d really like to do both writing and reading. 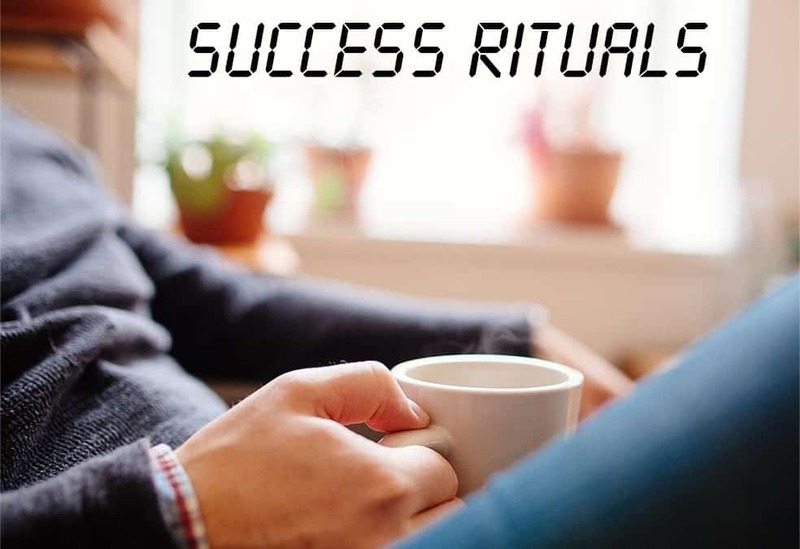 The total routine is reasonably manageable if nothing interrupts it, but between business, emails, and random occurrences in life, the ritual doesn’t always go as planned. And you should plan on that. Things won’t work out perfectly. You’ll fall, stumble, crash. Even if you take this ritual seriously, you’ll forget parts of it or the order (unless you write it down and read it each day). You’ll not feel like it some mornings. You might have an event that wakes you early and throws you off.Whatever it is, just move forward and try to improve 1% the next day. Remember this ritual should charge you up and empower you. Try to set at least one activity in each area: Mind, Body, Emotion, Spirit. Give structure but allow flexibility to your ritual, including a specific order. Try it, change it, change it back, improve it, and keep going. Whatever you put together, just move forward and try to improve 1% the next day. I’d like to learn more about L-Theanine. L-Theanine is a very safe way to get a boost of concentration. It’s best to take it with 100mg of caffeine. Instead of dangerous synthetic supplements, I always suggest people try something simple like L-Theanine to start with if focus is an issue.